The venographic prevalence of deep vein thrombosis in people with distal lower-extremity injuries that require surgery or casting ranges from 10% to 40%. But a prospective cohort study in the May 21, 2014 JBJS found that only 0.6% of 1200 patients with lower-leg fractures and no medical or mechanical thromboprophylaxis had symptomatic, objectively confirmed venous thromboembolism (VTE) over a 12-week follow-up. Moreover, none of the seven thrombotic complications was fatal. This leads the authors to conclude that “the risk-benefit ratio and cost effectiveness of routine anticoagulant prophylaxis are unlikely to be favorable for these patients.” They go on to say that despite the large sample size in this study, the low prevalence of VTE made it impossible to pinpoint characteristics that could identify a subgroup of similar patients who might be at higher risk of clotting problems. Many practices are investing in expensive EMR systems while overlooking simpler ways of lowering costs and increasing efficiencies. According to Jay Crawford, MD, pediatric and adolescent specialist at Knoxville Orthopaedic Clinic, optimizing patient scheduling is one of many simple improvements that could maximize practice revenue. Crawford has developed a new mobile app and cloud-based solution that helps redirect patients who don’t need to be seen by an orthopaedic surgeon, increases brandawareness for a private practice, and drives efficiencies. According to a recent JBJS readership study among more than 1,000 orthopaedic surgeons, print readership of JBJS remained fairly consistent from 2012 to 2014; 91% accessed the JBJS print edition frequently/occasionally in 2012, and 87% did so in 2014. 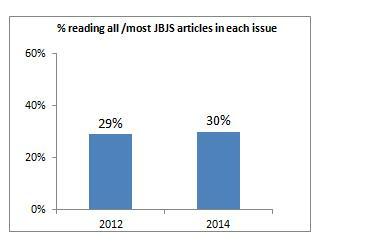 The percentage of respondents accessing JBJS online access jumped significantly from 58% in 2012 to 74% in 2014. Roughly 30% cited reading all/most of their issue in both the 2012 and 2014 studies. Additionally, the survey revealed a slight increase in relevancy of JBJS to clinical practice/research compared to 5 years ago. 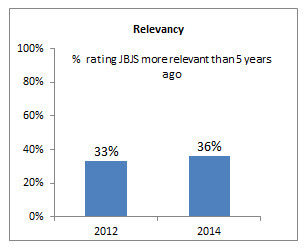 In 2012, 33% stated JBJS was more relevant compared to the past 5 years; in 2014 36% rated JBJS more clinically relevant that it was 5 years prior. Some doctors and patients may hold off on joint replacement surgery until the pain becomes unbearable and mobility is severely limited. But data from FORCE-TJR—a joint replacement database administered by David Ayers, MD and Patricia Franklin, MD at UMass Medical School–now shows that there is an ideal time for patients to get the most out of hip or knee replacement surgery. A nationally recognized physical composite score for individuals with no joint pain or functional limitations is 50. A study, based on 17,000 patients in the FORCE-TJR database reveals that patient scores improve an average of 12 points after total joint replacement surgery. But that data also suggest that if a patient’s function is severely impaired before surgery (a score of 25 or lower), that patient may not achieve the same amount of improvement as a patient who had surgery at the ideal time (determined in this study to be a score of 32). “On average, TJR patients can achieve scores of 44 or greater and approach the function of non-arthritic patients after surgery. But, 20 percent of patients who wait until their score is 25 or lower generally don’t get the full 12 points of improvement. In fact, 40 percent of those who wait this long only achieve post-surgery function at the arthritis level of 32,” said Dr. Franklin. The June 18, 2014 article, “Normal Health-Related Quality of Life and Ability to Work Twenty-nine Years After in Situ Arthrodesis for High-Grade Isthmic Spondylolisthesis” by Joelson et al. reports results that challenge the current approach generally used in treating this pediatric spinal disorder. Sweden and neighboring Scandanavian countries have been leaders in studying long-term results of treatment for a wide variety of orthopaedic conditions, with an impressive rate of follow-up in this relatively stable population. This article is one more example. Thirty-five of 40 patients were evaluated with physical examination and patient-reported outcome questionnaires at a mean of 29 years and a minimum of 23 years following L4-S1 posterior fusion and L5-S1 anterior fusion for isthmic spondylolisthesis over 50%. Harrington rod spinal instrumentation was used in 15% of the cases, while the others were treated with postoperative casts for 3 months. All patients were reported to have a solid fusion from the initial surgery, and there was no motor function loss. While there was a substantial range of scores in the outcome questionnaires, there was no significant difference in outcomes between the surgical patients and norms for the Swedish population. Despite the results reported here, this approach to treating high-grade isthmic spondylolisthesis in the pediatric population has largely been replaced with pedicle screw and rod spinal instrumentation from L4 to S1, partial reduction of the slip, and posterior fusion, with anterior L5-S1 fusion added at times. The primary problem with this approach is that there is a reported risk of iatrogenic nerve root injury in 8% to 30% of cases, with resultant weakness or absent function of one or more distal extremity muscles, even if intraoperative neurologic monitoring is used. The pendulum has essentially fully swung away from the treatment described in this article to the current instrumented approach. The use of post-operative casts with in situ fusion is considered old-fashioned and a treatment thought not acceptable to patients today. However, given the good long-term results reported in this article with in situ fusion and casting, this approach needs to be re-introduced into the pre-operative discussion and be included as a very acceptable surgical option for young patients with high-grade isthmic spondylolisthesis. While we await the long-term follow-up results of patients treated with spinal instrumentation, partial reduction, and fusion as practiced today, avoiding the risk of neurologic deficit in the lower leg will lead some parents to select in situ fusion and casting, with casts generally being tolerated quite well by pediatric patients. The number of manuscripts submitted to The Journal of Bone & Joint Surgery (JBJS) from physicians and researchers in China has been steadily increasing, but the overall acceptance rate is relatively low. While the quality of the research performed in China is rapidly improving, orthopaedic researchers in China recognize the need for education related to experimental design, manuscript preparation and manuscript review. In June 2014, Dr. Thomas Bauer, JBJS deputy editor for research, participated in a two-day workshop in Shanghai that focused on helping Chinese researchers prepare and submit high-quality journal manuscripts. During an afternoon workshop, Dr. Bauer and three other experienced Chinese editors/reviewers provided “face-to-face” reviewing with individual researchers who had provided and presented draft manuscripts. Dr. Bauer’s subsequent lectures included recommendations with respect to selecting the most appropriate journal for a specific paper, the contents of each section of a scientific manuscript, tables and figures, and how to respond to a manuscript review. He also described the general review process at JBJS and discussed “misbehaving authors,” including issues related to attempted duplicate publication, fraud, image manipulation, and plagiarism. Based on review of 50 manuscripts from China that had been rejected, Dr. Bauer tabulated the reviewers’ comments to identify the most frequent reasons for manuscript rejection. The most frequent criticism reflected insufficient information about the number of patients or specimens and the lack of an explanation for sample size. Dr. Bauer also illustrated several recent manuscripts from China that have been published in JBJS and in JBJS Case Connector. Several other speakers also discussed issues related to experimental design and statistics. The lively discussion from the audience of more than 100 researchers reflected intense desire to publish the best possible work in JBJS. We anticipate a striking increase in the number and quality of manuscripts from China in the near future. In a recent study by Manhattan Research, 40% of physicians said that the use of digital communication technologies– including patient portals, emailing and texting with patients, and using mobile health-monitoring apps–has improved patient outcomes. Jonathan Linkous, chief executive officer of the American Telemedicine Association, told Medscape Medical News (login required) that “I think we’ve turned a corner in the last year or 2 among providers. They’re certainly not all lined up with telemedicine. But they’re realizing the benefits, and costs are significantly reduced for a lot of this technology.” According to the research, 22% of physicians are texting their patients while a fourth are communicating with patients through online portals. More than one in five physicians reported they have monitored patients remotely, but video consultation has not yet caught on; fewer than 10% said they had done that. James Avallone, director of physician research for Manhattan Research, said, “As we move to an outcomes-based model of healthcare provision in the U.S., remote monitoring and telehealth are going to drive an extension of the point of care.” However, monetizing fees from nonvisit care delivered through online technologies remains a major hurdle. Are Quality Metrics Missing the Point? De-emphasizing the culture of testing. “When a test…is the centerpiece of care strategies, patient care can be compromised,” Dr. Yeh writes. In turn, achieving those three things will require that all clinicians focus on “mastering the skills of listening, empathy, and patient partnership,” Dr. Yeh concludes. Journals provide third-party validation for research reports. If you get published in a better journal, your work will likely be perceived as having been more successful. Editors and publishers feel the same way when it comes to how our audience rates our products. So we were very pleased when a recent independent third-party study found that our new review journal, JBJS Reviews, has rapidly become the #3 online journal in orthopaedics. JBJS Reviews was launched just over six months ago, but it is already viewed as one of the top 3 professional resources for quality content, helping run an orthopaedic practice, and keeping surgeons informed. There are many other categories, but you get the idea – JBJS Reviews is already proving its worth. Our Editor-in-Chief for JBJS Reviews, Tom Einhorn, MD, has done a fabulous job getting this new journal off the ground, and dozens of authors have contributed excellent reviews, and more are scheduled. We’re excited about the potential here. That being said, the Journal of Bone & Joint Surgery still ranks #1 in nearly every category, so we have a lot to build upon there, as well. And that’s how we view it – being #1 is not a destination but an expectation, as is quickly joining the top 3. We need to keep working at a high level, improving what we do, and delivering great information in all formats. Earlier this year, the Journal introduced the Peer-Review Statement, granting readers insight into how articles are peer-reviewed. A high percentage of readers find this valuable, we’ve learned. We are also introducing an integrated tablet app for iOS and Android devices. All our journals – the Journal, JBJS Reviews, JBJS Case Connector, and JBJS Essential Surgical Techniques – will appear in the single app. Best of all, if you already use the JBJS Reviews app, your next update will give you the integrated app seamlessly. We value our readers and know how important your work is and how valuable your time is. I hope these improvements and high-quality resources serve you well.